I have a problem with my pc...My pc has windows server 2003 on it and web server and SQL server 2000 is running on it, and my asp.net web site running on this machine. Moving to Hardware because of a gut feeling, and if the experts there give you a clean bill of health, I'll move it back. The first questions they are going to ask are the system specs and heat, so try to have that info for them. Download Speedfan, using the link in my signature (The download link is in the first line of the second paragraph), and install it. 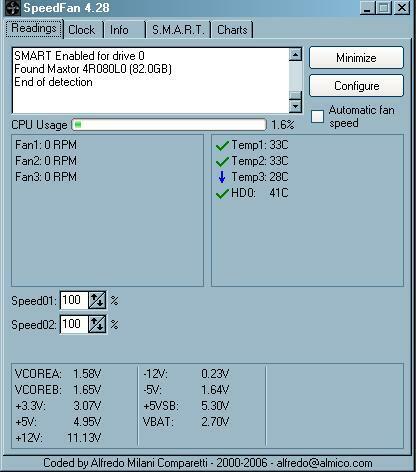 Once it's installed, run the program and post here the temperatures it shows. The information I want you to post is the stuff that is circled in the example picture I have attached. 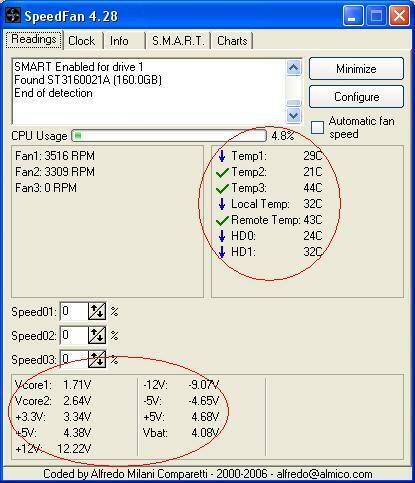 And Sometimes my cpu fan makes weird noise in a short time, like exhausted noise...and also cpu fan is touching somewhere and making little noise(???) maybe i am wrong but all i can see thesee sypmtoms.i am keeping whatched it, in 4 hours it didnot shutdown itself yet. Id rather go for the thermaltake, rosewill is kinda a cheap brand. The VcoreA and VcoreB lines look screwey, but the important voltages look very good now. Good luck. Edited by WinCrazy, 30 April 2006 - 01:17 PM. Those stats look fine now. All the values are in range of where they should be and since you are having no more shut down problems I wouldn't worry about it. One thing I do want to ask though, is how many fans do you have in your computer? Not including the fan on the processors, do you have at least one fan on the front of the case and one on the back? If you don't I suggest you do so. Fans are relatively cheap, maybe $10-15 apiece. Just make sure you have one fan blowing air IN from the front of the case and one fan at the back of the case blowing air OUT and you'll be fine. Doing this will maximize the amount of AIR FLOW through the case and keep the temperatures down. Fenor, Actually i was thinking about the fans but it is good to heard that from the experts, i will do it, because my pc is running really heavy applications(sql2k,iis,d/c,dns,rras,vstudio2005...), but the case is always open and there is a big fan on the side is running for my pc and by the time for me ..
hi guys!, my pc also reboots alot. and I tried formatting and reinstalling os, but nothing works. then I tried SpeedFan and heres the reults. kinda looks bad, but I dont quite understand it, so can anyone help me. Edited by aldwin, 15 May 2006 - 08:35 AM.